Summary: A boy travels through the world alone. He starts off with a tribe of kids—goats—then has fun with a colony of penguins and a pod of whales. He climbs on a formation of rocks, then falls down into a pile of rubble. He hangs out with an army of caterpillars, then marvels at a flight of butterflies. Finally, he finds the tribe of kids…his tribe, and he is no longer alone. 40 pages; grades K-4. 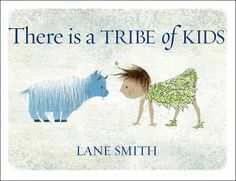 Pros: There is more than meets the eye to this simple but gorgeously illustrated book by Caldecott honoree Lane Smith. It’s not a story so much as a meditation on adventure, coming home, and finding where you belong. And the collective nouns are always fun, as well. Cons: Kids may not appreciate this if they hurry through it. It’s a book that requires a slow, careful look…maybe more than one.